Spacious suite with sitting area. Room Facilities: Safety Deposit Box, Air Conditioning, Desk, Seating Area, Heating, Sofa Bed, Bath, Hairdryer, Free toiletries, Toilet, Bathroom, Bath or Shower, TV, telephone, radio, satellite TV, Minibar, Wake Up Service / Alarm Clock, Balcony, patio, View Living room: 29 m² beds: 2 Single (s), 1 Double (s) large. Taxes: EUR 1.50 city tax is excluded stay per night per person. This room has a large balcony with sea view. 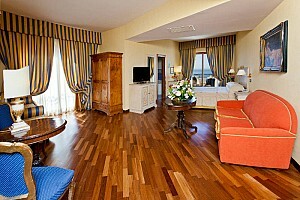 It is equipped with wooden floors, high quality and a bathroom with Vietri ceramics hand-colored. At the time of booking please indicate your bedding preference. Room Facilities: Safety Deposit Box, Air Conditioning, Desk, Heating, Hairdryer, Free toiletries, Toilet, Bathroom, Bath or Shower, Telephone, Radio, Satellite TV, Minibar, Wake Up Service / Alarm Clock, Balcony view living room: 19 m² beds: 1 Double bed (s), or 2 Single (i) Taxes: EUR 1.50 city tax is excluded stay per night per person. With parquet floors and a bathroom with Vietri ceramics hand-colored. At the time of booking please indicate your bedding preference. Room Facilities: Safety Deposit Box, Air Conditioning, Desk, Heating, Wooden Parquet floor, Hairdryer, Free toiletries, Toilet, Bathroom, Bath or Shower, Telephone, Radio, Satellite TV, Minibar, Wake Up Service / Alarm clock Alarm bed type: 1 Double bed (s), or 2 Single (i) Taxes: EUR 1.50 city tax is excluded stay per night per person. With parquet floors and a bathroom with high quality ceramics hand-colored glasses. Room Facilities: Safety Deposit Box, Air Conditioning, Desk, Heating, Wooden Parquet floor, Hairdryer, Free toiletries, Toilet, Bathroom, Bath or Shower, Telephone, Radio, Satellite TV, Minibar, Wake Up Service / Alarm Clock Bed Size 1 Double or 1 Double French French Taxes: EUR 1.50 city tax is excluded stay per night per person. 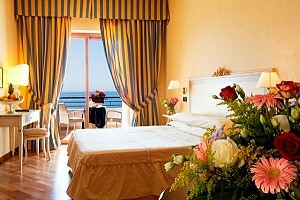 Punta Campanella Resort offers a hospitality-oriented maximum comfort, thanks to the facilities available to it.